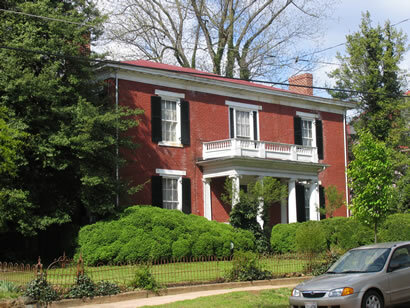 This classic Greek Rivival was built in 1845 for Samuel Garland, Sr., whose name the neighborhood took. Garland, a lawyer, obtained his wealth from his two Mississippi cotton plantations. This entire block was at one time enclosed on three sides by a brick wall and known as 'Lynch's Garden.' Note the Ionic porch details.